With Dubai’s growing collection of residential golf communities offering an evergreen lifestyle and escape from the rat race, it’s not just ardent golfers who buy into the dream of living on a golf course. World-class golf courses and international PGA tournament host status have put Dubai on the global golfing map and now its golf-themed real estate developments are attracting a new tranche of investors and residents, but for very different reasons. 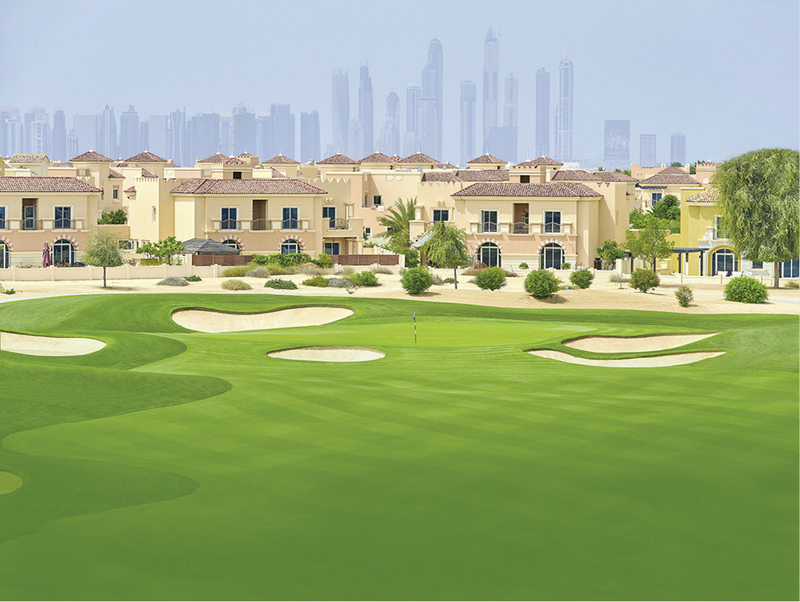 “Living in a golf development away from the stressful hustle and bustle of city life offers a calm, safe and secure environment, and for families especially, this is a major value add,” says Vijay Sajjanhar, chief financial officer of Dubai Sports City, developer of the Victory Heights community. “In the UAE, the demographics of the residents in such communities defy the typical profile that applies to most parts of the world, with golf community properties owned by a much younger investor, with families eager to reside in a gated community with vast green landscaping and premium amenities for both adults and children,” says McLoughlin. The growing collection of golf-focused communities includes Emaar’s Emirates Hills The Montgomerie Dubai and wasl’s duo of landscaped neighbourhoods at Dubai Creek Golf and Yacht Club and Emirates Golf Club, as well as emerging outlying developments beyond Al Khail Road. PW takes a look at a few of these luxury housing communities. The focus of this master-planned, 55-million-sq-ft mixed-use development is on greenery and the great outdoors, with around 50 per cent of the community dedicated to open spaces. With the Trump International Golf Club its leisure centrepiece, Akoya Oxygen by Damac Properties comprises 12 golf course-facing, low-rise residential villa clusters, a number of which have been designed in collaboration with luxury brands such as the Ettore 971 Bugatti Villas and Just Cavalli Villas. Two more clusters are to be released. Nature-inspired community facilities include the under-development upscale Vista Lux retail and dining promenade, a hydroponic café and organic market, as well as a desert-inspired luxury spa, yoga enclave, series of water play fountains and, of course, access to the Tiger Woods-designed 18-hole golf course. The three- to six-bedroom semi-detached or standalone Just Cavalli villas in the Aquilegia cluster were designed in collaboration with the Roberto Cavalli Group and are the first villas in the world to feature Just Cavalli signature interiors. Ranging in size from 2,099-3,240 sq ft, other selling points of the villas include rooftop terraces, lower ground-floor space for additional family recreational or utility use and access to the community’s Just Cavalli-branded gym, children’s play area, barbecue area and outdoor cinema. Villa prices start from Dh1.3 million. Communities such as Akoya Oxygen attract buyers who aspire to a certain lifestyle that only these integrated communicates can offer. Young and mature audiences are attracted to the experiences they present, besides being an investment that will provide high returns. It’s Akoya Oxygen’s luxury green living credentials that really set the development apart, with low emission residences utilising recycled materials and solar energy. Homes feature energy-efficient materials and low-emission paints, and will incorporate energy-efficient lighting and air conditioning, solar-heated water systems and landscape irrigation. The road network within the development is also designed to minimise pollution, with dedicated spaces for bicycles and hybrid and electric cars. Location: Out on the Umm Suqeim road in Dubailand, it is just 25 minutes from the city’s major commercial and leisure landmarks and accessible via all main arterial routes. Schools: The area has its own prep school and nursery but nearby you have the Deutsche Internationale Schule Dubai, Gems FirstPoint School, Gems Wellington Academy and the Indian International School. Shopping: Retail amenities are under development but Dubai Outlet Mall is just up the road and major retail destinations such as The Dubai Mall and Mall of the Emirates are less than 30 minutes away. Health centres: The nearest hospitals and clinics include Medicentres in Dubailand, Aster Clinic at Silicon Oasis and the Farha Clinics Children Centre. A 1,119-hectare residential golf destination comprising 16 independent communities set amid two internationally acclaimed championship golf courses designed by Greg Norman, Jumeirah Golf Estates features a collection of luxury apartments, town houses, villas and lifestyle amenities interconnected by communal ring road links. Around 75 per cent of the homes come with guaranteed golf course views. As well as ringside access to the DP World Championship action — from your garden in many cases — the community has 16km of jogging and cycling paths and 15 lakes. The Mediterranean-themed clubhouse, which is centrally sited between the Fire and Earth courses, has three dining outlets and residents also have access to a gym, running club, swimming pools and newly opened retail centre. Redwood Park’s cobblestone streets and Tuscan-inspired three- and four-bedroom Choi and Cabrera town houses all come with spectacular fairway views of the Fire golf course. The 75 units overlook the 11th and 12th holes and range in size from 2,875-3,587 sq ft. Each residence has a private garden, rooftop deck and access to a community swimming pool, children’s pool, play area and park with landscaped water features, fountains, a barbecue kiosk and visitor parking. The prices of the town houses start from Dh3 million. Jumeirah Golf Estates has residents representing over 60 nationalities with 60 per cent choosing the development for its remarkable outdoor living experience. A premium residential community in the heart of New Dubai, the luxury standard of the homes, regardless of size or value, matches the superior quality of the greens. Rental yields for apartments are up to 10 per cent, with villas ranging from 4-5 per cent, and capital appreciation for the apartments anywhere between 20 per cent and 30 per cent. Location: Situated on Shaikh Mohammad Bin Zayed Road, the development is 15 minutes from Dubai Marina and the Al Maktoum International Airport, while the Expo 2020 Dubai site are also within easy reach. The Dubai Metro expansion is expected to include a station serving the community, while there will also be a series of bus stops. Schools: Victory Heights Primary School and Arcadia Preparatory School are currently the closest schools, but this year the community will have its own scholastic offering with the opening of Brighton College Dubai and Dwight School of New York. Shopping: City Centre Mei’aisem and Choithrams are a short drive away with Mall of the Emirates and Dubai Marina Mall around 25 minutes by car. Health centres: Mediclinic Middle East is the nearest facility, while Dubai Sports City’s health care providers are a 15-minute drive. Occupying the western half of Dubai Sports City, Victory Heights is a 3.8-million-sq-ft development made up of a series of distinctive villages. A prestigious gated community that features a harmonious balance of well-appointed villas, handsome neighbourhoods and lush landscaping, residences are nestled in and around the multi-award-winning Els Club golf course, with a strong emphasis on green spaces. The residential portion of Dubai Sports City has access to world-class sporting and recreational facilities and amenities, including a sports and fitness club, swimming pool, basketball courts, parks and play areas. There’s even a year-round calendar of events such as family-friendly fêtes and seasonal festivals. The ninth and newest community under the Victory Heights’ umbrella, Marbella Village, features 96 thoughtfully designed and master-crafted four-bedroom town houses plus a maid’s room, with an average plot size of 2,600 sq ft. Spanish-influenced architectural exteriors, Italian-styled kitchens with the latest modern fittings and matching door and floor colour schemes define the scheme’s eye for detail. Residents also have their own area community centre. Prices start from Dh2.9 million. Victory Heights residents represent a mix of nationalities reflective of our diverse product mix, and include expat Arabs, Indians, Europeans and investors from the sub-continent; which goes to show that if the product is good it cuts across demographics. As a community, it has one of the lowest number of villas for a full-fledged, 18-hole golf course. The normal density is 1,500-3,000 units, and we capped it right from the start at 1,100 units. What also makes us unique is that each product or village has a point of differentiation and we will also be a future stop on the metro network extension. Location: Located on the Mohammad Bin Zayed highway with two dedicated access points, the community is just 5km from Dubailand’s theme parks and Dubai Motor City, while major commercial and leisure destinations are no more than 30 minutes by car. Schools: Four schools and nurseries, including Bradenton Preparatory Academy, Victory Heights Primary School and the Wonder Years Nursery, are currently up and running with another seven to come. Shopping: Mall of the Emirates and Dubai Marina Mall are less than 20 minutes away by car, with Mirdif City Centre around 15 minutes away and Motor City’s diverse retail scene close by. Health centres: Life Medical Centre, Welcare Ambulatory Centre, Top Medical Centre and Saudi German Hospital are all within a 10km radius.